Human Rights Activists News Agency (HRANA) – Eight labor and environmental activists were released from custody Wednesday, September 8th after being tried and interrogated for “Disturbing Public Order” and posting a bail of approximately $3000 USD (300 millon Rials). 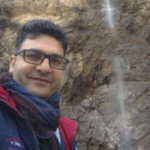 HRANA confirmed the identities of the released activists: Khaled Hosseini, Mozafar Salehnia, Ali Mirzaei, Vali Nasri, Hajar Saeidi, Hossein Goili, Habibollah Karimi and Reza Amjadi, all residents of Sanandaj (Capital of Kurdistan Province). 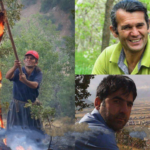 Within two days of their trial, all eight were either summoned or detained for having organized a funeral in honor of Sharif Bajour and three other environmental activists who died of smoke inhalation and burns while fighting the Marivan forest fire. HRANA reported on the arrests of Khaled Hosseini and Mozafar Salehnia on September 4, 2018. Human Rights Activists News Agency (HRANA) – A forest fire claimed the lives of four environmental activists who were working to contain the flames searing through Marivan (western Iran) on Saturday, August 25, 2018. 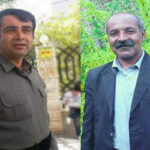 Sharif Bajour and Omid Kohnepoushi, members of the Chya Green Association, and Mohammad Pazhouhi and Rahmat Hakiminia, members of the Marivan Department of Environment, died from smoke inhalation and severe burns. Two others — Mokhtar Aminejad, 33, and Mohammad Moradveisi, 57 — were injured in the flames. Moradveisi was transferred to the city of Sanandaj by helicopter due to the severity of his burns. Bajour was a member of the Board of Directors of the Chya Green Association and a well-known environmental activist who had reportedly been arrested and interrogated several times by security apparatuses in regards to his environmental activities. Chya Green Association was among the most active NGOs orchestrating efforts to contain the fire. Within hours of the activists’ deaths, Marivan citizens took to the streets in front of Bou-Ali hospital where the bodies of the dead are being held.